Have you read Gone Girl (affiliate link) yet? If not, why haven’t you?! Somehow this summer I started reading books that were coming out in movie form this year. It started with The Fault in Our Stars(affiliate link) . I can’t even talk about that book or I will start crying. So emotional yet such a good read. Anyway, back to Gone Girl (affiliate link). It’s been out for a while and I even saw the previews for the movie and thought, nah I won’t read that or go see that movie. But then I kept seeing people talking about it online. So, of course another road trip was happening so I downloaded the audible version of the book. At first I wasn’t sure what to expect but then as I kept listening I wanted to google at my next pit stop to find out exactly what was going to happen next. There were so many twists interspersed in the book that it kept you guessing as to what was going on. The book is written by Gillian Flynn and is about Amy and Nick Dunne. This young couple is celebrating their fifth anniversary when Amy goes missing. Naturally Nick is a suspect and things happen throughout the book that make you question how innocent or guilty Nick actually is. There are secondary characters that contribute to the book and really make you question everything that is said and done. A definite thriller. When I got to Part Two, my mouth literally dropped. Like I was searching for my phone to tweet out that my mouth dropped with this book. That’s how into it I was. But, of course, I was driving so I had to wait until I stopped for gas. Listening to #GoneGirl on the drive home and my mouth literally drops open when Part Two starts. Crazy. Can’t wait to finish this one. The audible version is 19 hours. Nineteen! My round trip was only twelve hours so by the time I got home, I couldn’t wait to finish it and ended up buying the kindle version and finishing the book. My coworkers had to hear about how great this book was and both have since read it. We all can’t wait for the movie to come out as it looks like it will be a great one. I don’t want to say anything to give away the shockers in the book so I will just say – ORDER THIS BOOK! Now for the recipe. It’s rather simple and came about because on the morning of their anniversary, Amy made Nick some crepes. I mean seriously. How sweet is that? What a wonderful wife, right? My version is a Weight Watchers friendly version and oh so good. If I had a husband, I’d make these for him too. But that’s about all I’d take from Amy Dunne’s Guide to Marriage. Enjoy! In a medium bowl, add egg whites, salt, vanilla extract, melted butter, milk and flour. Whisk until just combined. Spray an 8- or 9-inch crepe pan or skillet with cooking spray. Place on stove and set over medium heat. Once pan is hot, add 1/4 cup of batter and tilt skillet to cover entire bottom of pan with a thin layer of batter. Cook for 2 minutes the flip over crepe. Cook for 2 minutes more. Remove from skillet. Repeat process with remaining crepes. 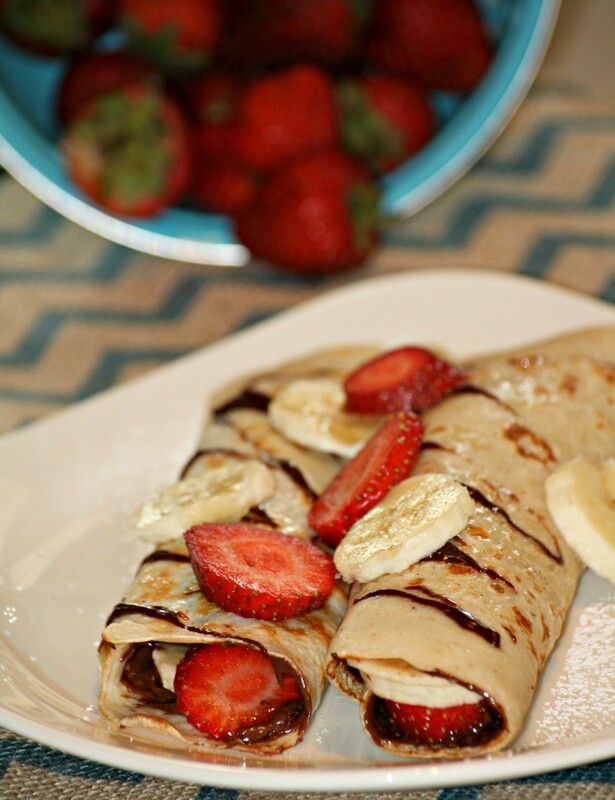 Top with about 1 Tbsp Nutella, strawberries and bananas. Fold crepe over or in thirds and sift powdered sugar on top. Serve with additional strawberries and bananas. Makes 4 servings. 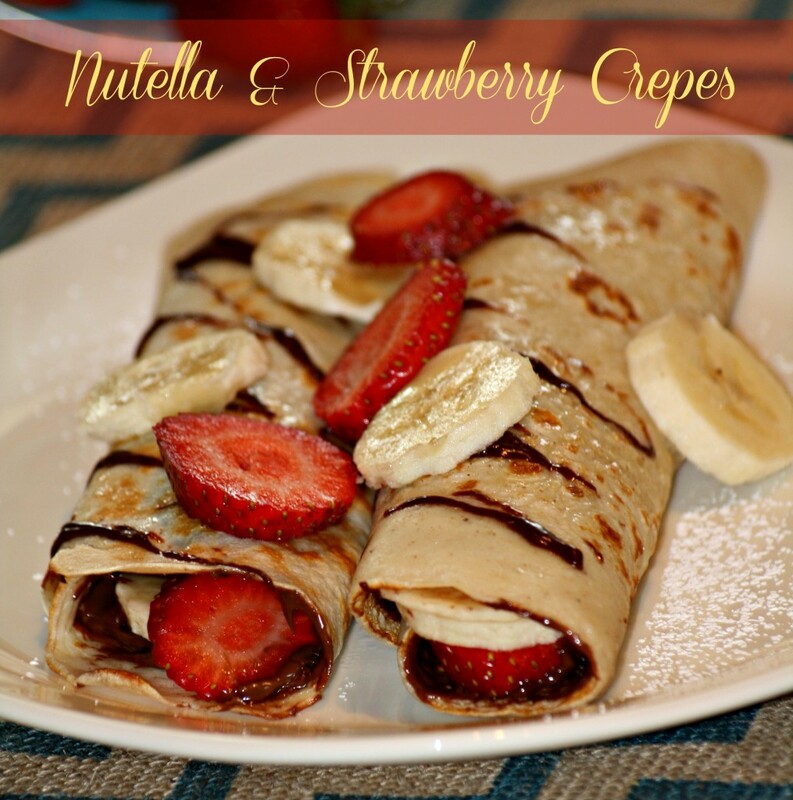 Yields 1 crepe per serving. * Note there are affiliate links in this post. If you click on the link and order from Amazon, they will give me a small commission at no cost to you.